Passive Cooling - Razavi Medical Complex | Design Cues - Chartered Architects, Interior Designers. Passive Cooling The term “passive” implies that energy-consuming mechanical components like pumps and fans are not used. a. 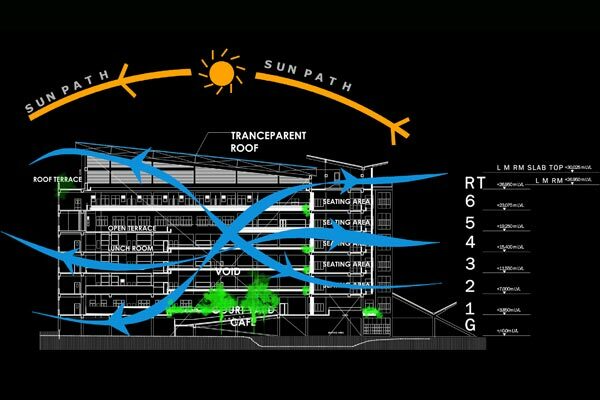 Slow heat transfer into a building. This involves an understanding of the mechanisms of heat transfer: heat conduction, convective heat transfer, and thermal radiation (primarily from the sun). b. Remove unwanted heat from a building. In mild climates with cool dry nights this can be done with natural means of ventilation. In hot humid climates with uncomfortable warm / humid nights, ventilation is essential therefore, improvised Passive Cooling completed with some mechanical ventilation appears to be a win-win situation for user and the owner. c. Introduction of fresh air by means of active and passive methods is essential to create a healthy atmosphere in wards and public areas and to avoid cross contamination in healthcare facilities. d. Passive cooling is essential to avoid “Sick Building Syndrome” in healthcare facilities. This is a topic which we are engaged in designing and research. Design Cues, established in 1994, began with the belief of promoting natural tropical climatic solutions to solve today’s design problems. Hence, nature acts as the ‘cue’ in the act of creation’ – this is our underlying philosophy in all the work we undertake. Passive solutions to energy saving is the constant leitmotif of our design philosophy. Our journey began by dealing with small scale housing and now capable of solving complex “Healthcare” problems to solving “Urban Design” issues with the aid of a multi-disciplinary team.